Submit the application form and non-refundable application fee. Submit a copy of High School Diploma and/or Official College Transcripts. 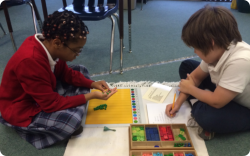 Submit a required essay explaining why you want to be a Montessori guide. Students with foreign degrees are required to have transcripts evaluated for USA equivalency. This school has a Certificate of Approval from the Texas Workforce Commission (TWC). The TWC- assigned school number is: S 4844. The school’s programs are approved by TWC. Students must address their concerns about this school or any of its educational programs by following the grievance process outlined in the school’s catalog. Contact information for TWC is available at this website: www.texasworkforce.org/careerschoolstudents.